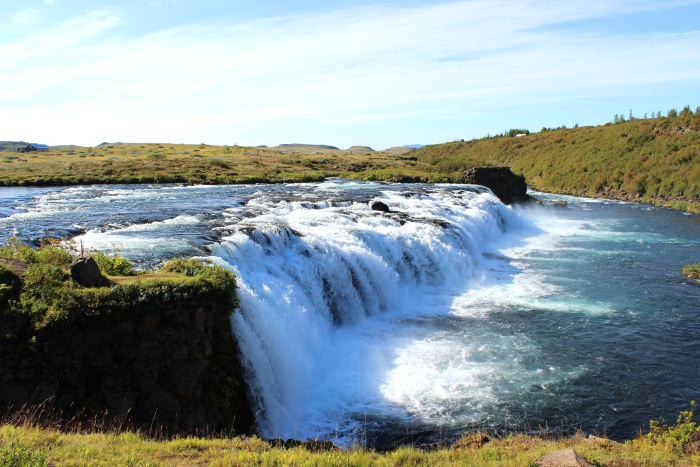 Faxi – sometimes called “Vatnsleysufoss” – is a small, but lovely waterfall located on the Tungufljót river. Our tour guide explained that this is a good place to begin the Golden Circle tour, as it wouldn’t seem as impressive when compared to the other gigantic waterfalls in the area (see Iceland Day 2: Gullfoss). It is a bit of a hidden gem, as it’s not visible from the road and easily missed. There is a small gravel parking area, and you can walk down the little hill to get up close – but keep in mind there is a lot of mist! There is another path at the top of the waterfall, where you can also get a view of the fish ladder that runs next to it, as well as the surrounding community sheep fields.